Medieval Times recently introduced a brand new show and this blog was invited to the premiere. Medieval Times is one of oldest dinner shows in Orlando and is also a show that I had heard lots about but had never seen. I was looking forward to the show! When we arrived, the evening started out in a large hall. This seemed like the preshow area and was honestly a little disappointing. Appetizers were served here and beside a repetitive knighting ceremony for the birthdays/anniversaries/etc, not much happened in here. All the bars and gift shops were open, but more needed to happen (court jester juggling or something?). Animals were also in the village. Here's a falcon. Eventually it was time for the main show and dinner to begin. Several rows of seating surrounded the stage, separated into color-coded sections. We sat in the green section, and therefore cheered for the green knight. Once everyone was seated, the first course of tomato bisque and garlic bread was served. The tomato bisque seemed like typical tomato soup to me, not exceptional but still tasty. The garlic bread was more interesting. It actually reminded me a bit of a garlic naan from an Indian restaurant rather that what I would expect at a dinner show. While we were eating our bread and slurping our soup, the show began and horses did all sorts of nifty tricks in front of us. Knights soon followed with a fun competition of jousting, sword fighting, and other nifty stuff. As the show was going on, the next courses were served. The chicken came next. Half chickens were served and we ripped them apart with our hands in a very medieval manner (unless you insist that they bring you silverware). The chicken was flavorful, although it was a little dry. Soon after the chicken, a rib and herb-basted potatoes were served. The rib was good, but the potatoes were really dry and flavorless. For dessert, we were served apple turnovers. According to one of the people working in the medieval village, the dessert is the only non-standard item on the menu and is always a surprise as to what will be served. The turnover was good with a flaky crust surrounding some apple jam. Before I knew it, the show was over. I never saw the old show, so I can't compare, but I enjoyed it. Overall, the Medieval Times was like an indoor renaissance festival with air conditioning and better food. Don't take it too seriously and you'll have a good time! 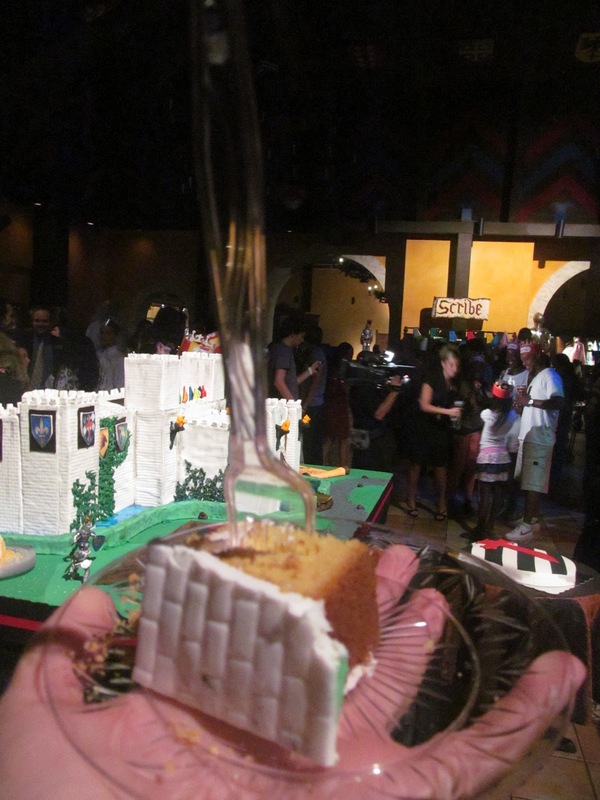 Medieval Times had a great castle-shaped cake made by a company called Cupcake Kisses sitting in the lobby/preshow area for the premier. It almost looked too nice to eat, but to my surprise the cake was cut with a sword and was served after the show. This was definitely the most architectural cake I've ever eaten! I had a good time at Medieval Times. Once the show got started, it was very entertaining. The food was all good (with the exception of the potatoes), and overall was fun night. If you've read this far into this blog post, it is your lucky day. I have a goodie bag from Medieval Times to give to one of my lucky readers. It contains two tickets to the show, fancy Medieval Times drinking cups, a Medieval Times hat and rain poncho, and some other extras. It can all be yours, all you have to do is like Watch Me Eat on Facebook and comment on the post mentioning the contest. Do this before August 7, 2012, you will be entered into a random drawing to win the prize. Good luck! After a day at New Smyrna Beach, I had dinner at an Italian restaurant called That's Amore. 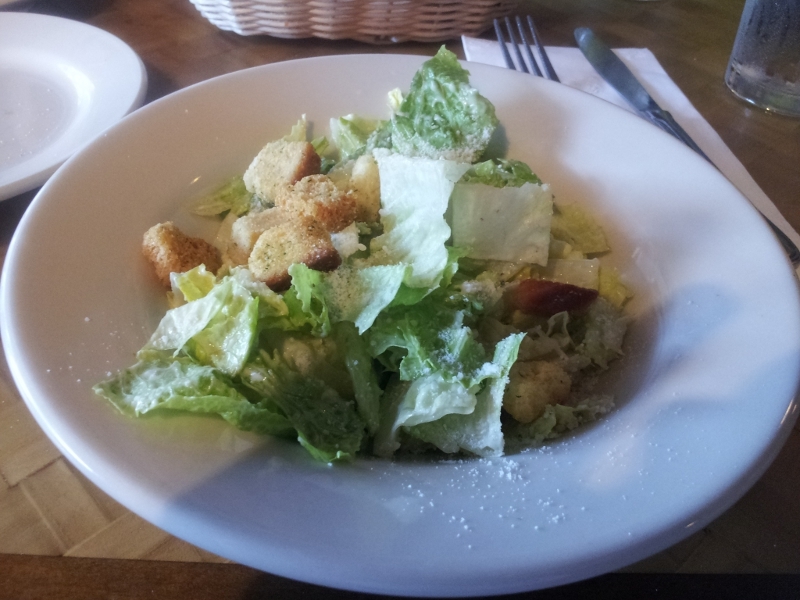 The meal started with a caesar salad. We shared a Margherita pizza for the main course. The pizza was very tasty with a nice, thin, crispy crust. It was topped with a good amount of cheese, sliced tomato, and basil. 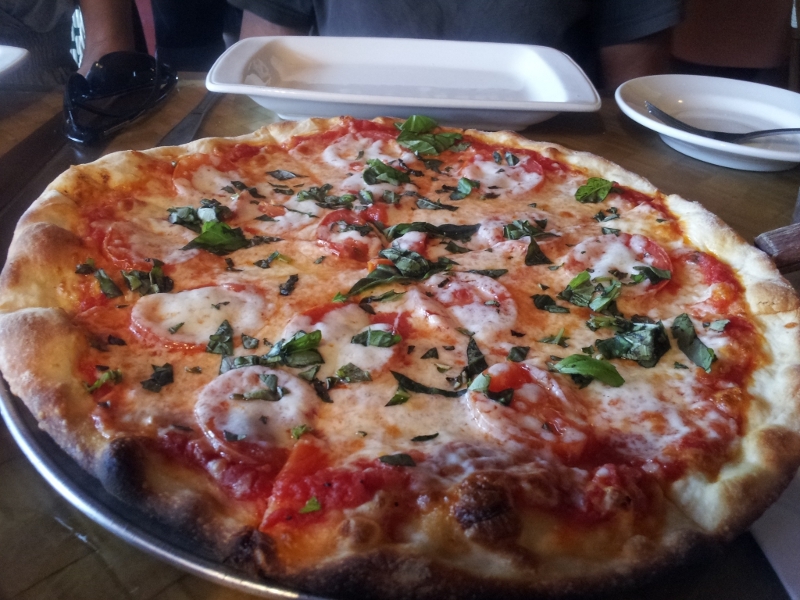 Since pizza from other Italian restaurants in New Smyrna has been disappointing, I'm definitely going to have to add That's Amore as a place to keep in mind after future visits to the beach. My dinner goal was to get some chicken from La Granja, but they had closed for the night. That meant my hunger drifted next door to the Habaneros Mexican Grill near the intersection of Semoran and Aloma in Winter Park. This restaurant was an Amigos the last time I was here, but I had been to some of Habaneros other locations and liked them. 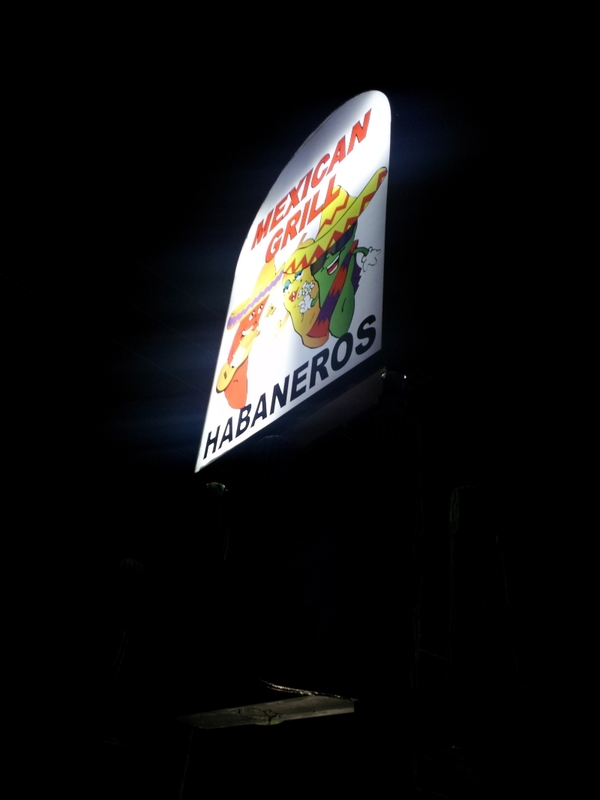 Turned out this place was better when it was Amigos and the food was subpar compared to the other Habaneros a few miles up the road in Casselberry. 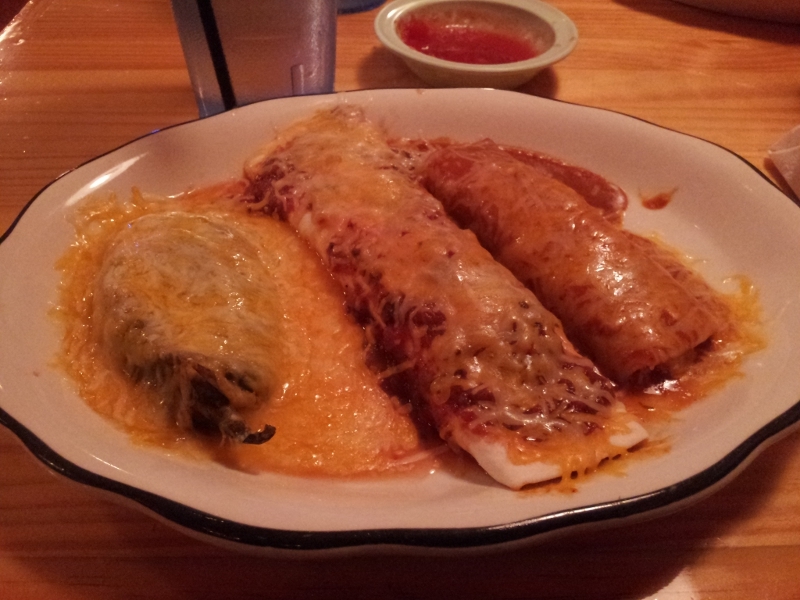 I had one of their dinner combinations which came with a chicken burrito, a chicken enchilada, and a chili relleno. It should have been good, but everything on the plate was flavorless. The burrito and enchilada were both filled with dry, bland chicken. The sauces on top tasted like tomato paste and not much else. The chili (which the waitress warned was really spicy) was like a soggy cheese covered bell pepper. The Pupusas truck has been around since the beginning of the food truck craze in Orlando. I remember seeing them at the first Food Truck Bazaar, but it wasn't until recently that I finally gave them a try. I had the traditional chicken pupusa.The pupusa consisted of chicken,cheese, and refried beans inside of a thick tortilla. This stuffed tortilla was topped with cabbage and carrots, and there was a selection of sauces to choose from on the side. On the return drive on my road trip to Baltimore, we took the scenic route back and ended up staying in Asheville, NC for the night. The next morning, we had breakfast at a restaurant chain that I haven't been to in a very long time. Waffle House seems to have the reputation of having scary food. When people call the place Awful House, that doesn't exactly make other people want to eat there. Regardless, I figured I might as well give them another try. I had the Fiesta Omelet, filled with ham, cheese, onions, tomatoes, and jalapeno peppers. Hashed browns and a biscuit were served on the side. The meal was actually above my expectations. The omelet was tasty, the biscuit was moist, and the hash browns were salty and good. Continuing with some more travel blogging, I had reached my destination of my road trip: The suburbs of Baltimore. While there, I did do some of the touristy stuff. I visited the National Aquarium for the first time (I think I'm jaded with sealife. I was disappointed) and wandered around the Inner Harbor. After I checked that stuff off my list of places to see, I moved onto seeing the more obscure sights in the area. One of the places that I ended up was called Quarry Lake at Greenspring. Apparently this man-made, 500 foot deep lake is one of the deepest in the state. As the name implies, the giant hole in the ground was originally a stone quarry which was then filled with water. The surrounding land was used to build a shopping center, expensive condos, and a paved trail surrounding the lake. When I read about Quarry Lake, I actually didn't realize how built up the area was. I went for the trail to ride my unicycle, but I figured while I was there, I might as well get dinner too. Food happened at a restaurant called Pizza Blitz. This pizzeria, serving mostly pizza-by-the-slice, was one of the few non-chain restaurants in the shopping center overlooking the lake. Time for some travel blogging! I drove up to Maryland at the beginning of June. One of my favorite ways to keep the drive interesting is seeking out little restaurants hidden away off I-95. All along the interstate south of DC, it seems like there's a whole lot of barbecue to be had. One of the barbecue stops on this trip was at the Smokin Pig in Pooler, GA. After following a billboard led me to a closed restaurant, I decided instead to put my phone to use. I did a search on Yelp and saw that the Smokin Pig was nearby. I also learned that I should avoid their cole slaw from Chris of Eat Local Orlando who had written the most recent review of the place. Aren't smartphones wonderful? I had the Pork Plate. The pulled pork came with garlic bread and two sides. I choose macaroni & cheese and Brunswick stew. The pork was served sauceless, but there were several barbecue sauces to choose from on the table. I liked their vinegar sauce, but their mustard based bbq sauce was even better. I've never seen mustard based sauce outside of Georgia and that's too bad since I really like it. The macaroni was average. The Brunswick stew was good, although it did remind me somewhat of vegetable soup. My co-pilot for the trip had a chicken sandwich. Looked like thick slices of chicken on a hamburger bun. She picked the cole slaw as her side. There was no complaints. I liked my food from the Smokin Pig. I'd stop here again if I lived in this part of Georgia, but I don't. That means I'll probably never return, but who knows, there are a few other BBQ places that I've made multiple visits to on my drives up I-95 (See Dixie Bones). Tomorrow is July 4. Seems like Independence Day in the United States has become one of the biggest hot dog days of the year (mostly due to the Nathan's contest). Because of the holiday, I suppose a blog post about hot dogs is in order. One of my recent excursions into the world of hot dogs was at Bite in Longwood. Bite is connected to Jeremiah's Italian Ices and does mostly hot dogs and burgers. I tried their Chicago dog. The dog was topped with tomato, onion, relish, peppers, celery salt, and mustard on a poppy seed bun. Normally dressing a hot dog up vastly improves a plain hot dog, but the toppings didn't do much for me in this case. The amount of toppings seemed skimpy to me and they ended up making the bun really soggy. Some pretty good fries were served on the side. The Southern slaw dog, topped with cole slaw, jalapenos, and fried onions was also ordered at our table. I personally didn't taste this one, but heard good things about it. The hot dogs at Bite were okay, but not anything extraordinary. They seemed a bit small for the price and the menu here really didn't do much for me. It really couldn't compete with the menu at Mustard's Last Stand in Melbourne. I did notice a review of Bite on Yelp mentioned hot dogs that were no longer on the menu that sounded a bit more interesting than what they serve now. I'm not sure if I'd go out of my way to return here.